Over ten years ago, Junior League of Lafayette recognized an opportunity to educate youth on the risks and consequences of driving while impaired, and with the unwavering support of our community partners, NO FEAR NO FUTURE was born. To date, over 10,000 students have participated in this life-changing, two-day initiative which exposes high school juniors and seniors to the realities and consequences of driving while impaired. Recently, Junior League of Lafayette expanded its NFNF program to include distracted driving. 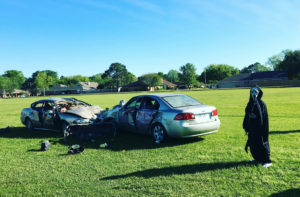 According to the U.S. Department of Transportation, 10% of drivers under the age of 20 who were involved in fatal crashes were reported as distracted at the time of the crash. This age group has the largest proportion of distracted drivers. Text messaging poses a triple threat because it combines three types of distraction – visual, manual and cognitive. In other words, texting involves taking your eyes off the road, your hands off the wheel, and your mind off the task of driving. JLL 2017 No Fear No Future Presentation from Glen Clark on Vimeo.